I added it to a pan with some rosemary infused olive oil (regular olive oil is fine) and a pinch each of salt and cracked black pepper. I sauteed until it was lightly browned on each side. I transferred the tempeh to a plate with some fabulous wooden tongs that my sister got me. 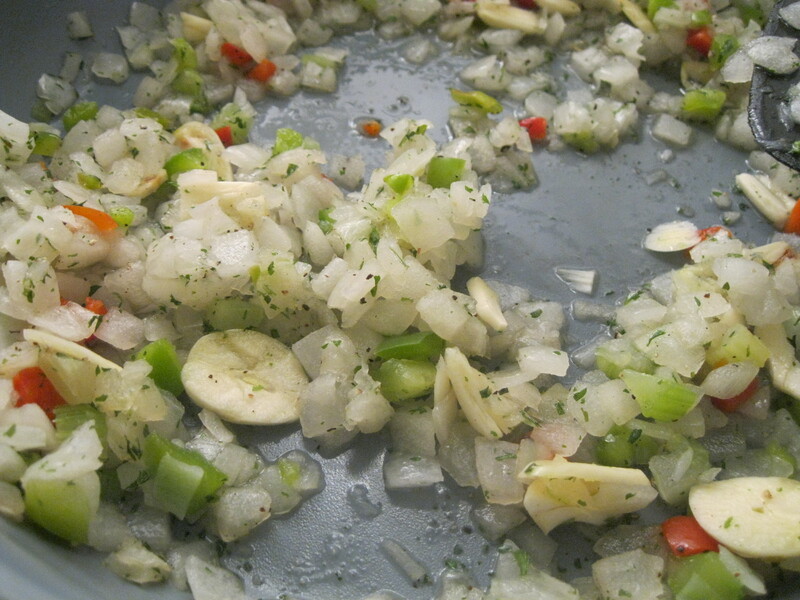 Then I added a chopped onion, 1/4 of a chopped green bell pepper and 1/4 of a chopped red bell pepper. 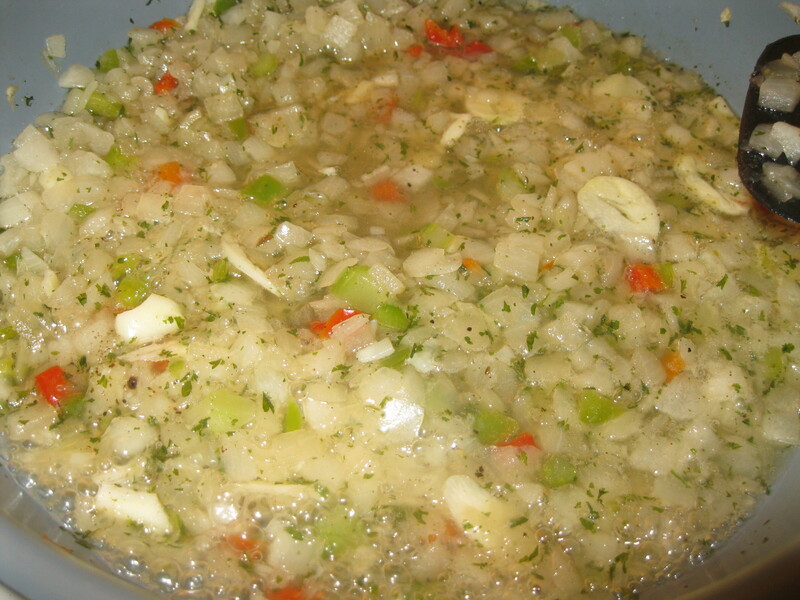 I sprinkled in some chopped parsley and slivers of garlic and sauteed until the onion became translucent. I added the white wine (I used a pinot gris and kind of wished I’d used a merlot. If you try that let me know how it goes. ), 1/2 tsp of dried oregano leaves, 1/2 tsp of cumin and a pinch of nutmeg and simmered until the wine was reduced by half. Then I added a half cup of vegetable bouillon, a tin of tomatoes, 2 tablespoons of capers and a pinch of cracked black pepper. I stirred it a few times to mix and then added the tempeh back to the pan, covered it with tomatoes and allowed it to simmer for another 20 minutes. Brent made some guinoa while we waited because it was what we had but I think this would be better with pasta or mashed potatoes. 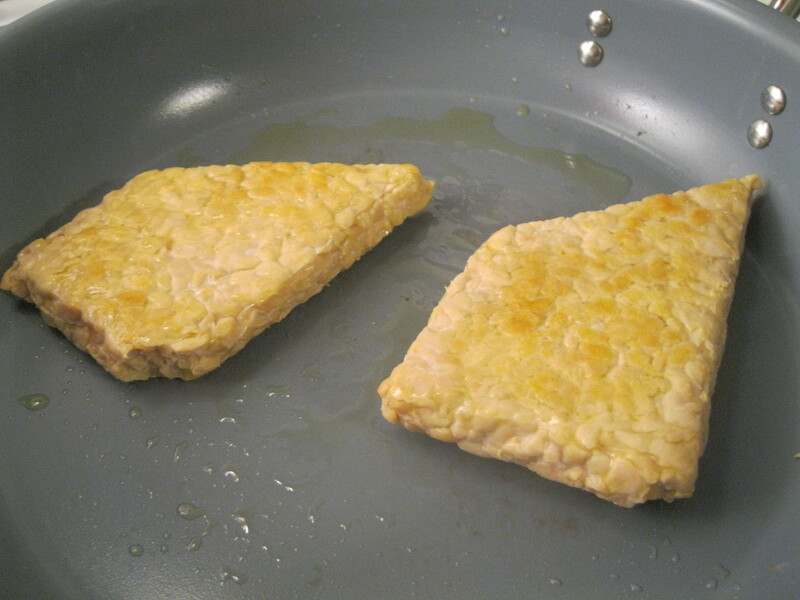 After 20 minutes, the tempeh should have taken on some of the characteristics of the broth. Put the tempeh on your quinoa, potatoes, pasta, whatever and spoon generous helpings of the remaining deglazing/reduction. I sprinkled mine with some fresh basil leaves. 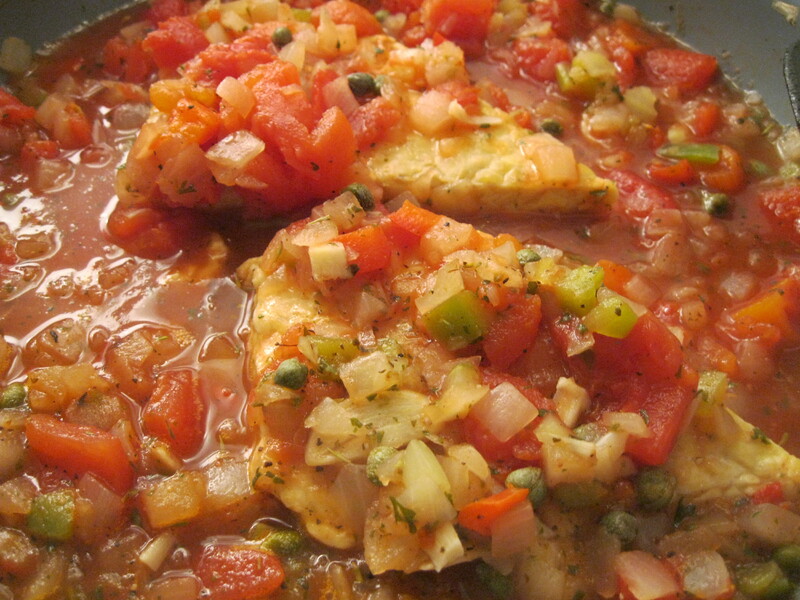 This is a hearty meal, full of savory and herbal flavors all brought out by the acid and sweetness of the tomatoes. 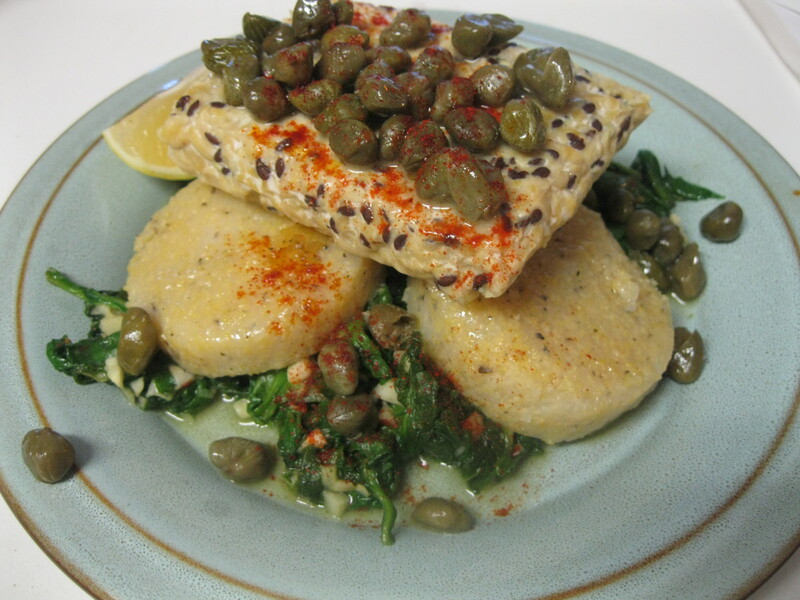 This would also work with chickpeas or seitan instead of tempeh for those with a soy allergy. It’s a surprisingly healthy crowd pleaser. A note for the health conscious: don’t be afraid of soy. There’s a lot of propaganda out there that says soy isn’t good for you for one reason or another. A word from your vegan scientist: the data suggest that soy is better for you than meat, dairy and eggs by a long shot, particularly if you’re worried about cancer (particularly colon cancer) or cardiovascular disease. This is Christie and Brent, signing off! 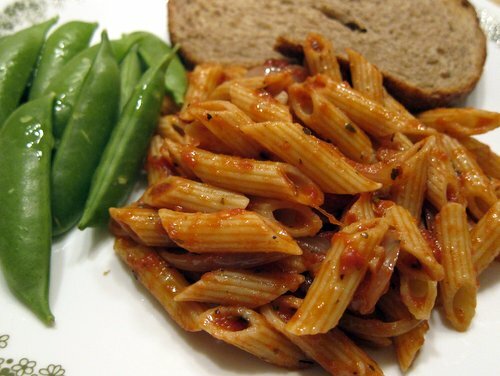 Celebrating Our One Year Anniversary With Easy Penne! Some of my favorite recipes are the ones that are the result of desperation: there’s lots of little things leftover in the fridge, half a box of pasta, nothing new or exciting, just random ingredients and your brain! I cooked some about a cup and a half of penne. Then, I heated up some olive oil, garlic, onions, and about 2/3 cup of marinara that I had leftover. I added a bit of balsamic vinegar and then I seasoned it with crushed red pepper and Italian seasonings and topped it with some capers. It was easy and delicious and I was able to finish off some of the things I had sitting in my kitchen and fridge. On another note, today is the one year anniversary of our first post on Turning Veganese! It came up really fast and it’s been a wonderful year of learning and bonding with friends and cooking and eating and getting healthy. We have an exciting giveaway coming up to celebrate this fantastic year! But first, we shall celebrate the US Thanksgiving holiday. We at Turning Veganese are grateful for YOU! Thank you for your support and for all the fun. Melissa is the author of the best piccata vegan or not. We decided we wanted some so we changed up a couple of the elements and were pleasantly surprised. We started by preparing some tempeh according to Melissa’s recipe and setting it on low to simmer. 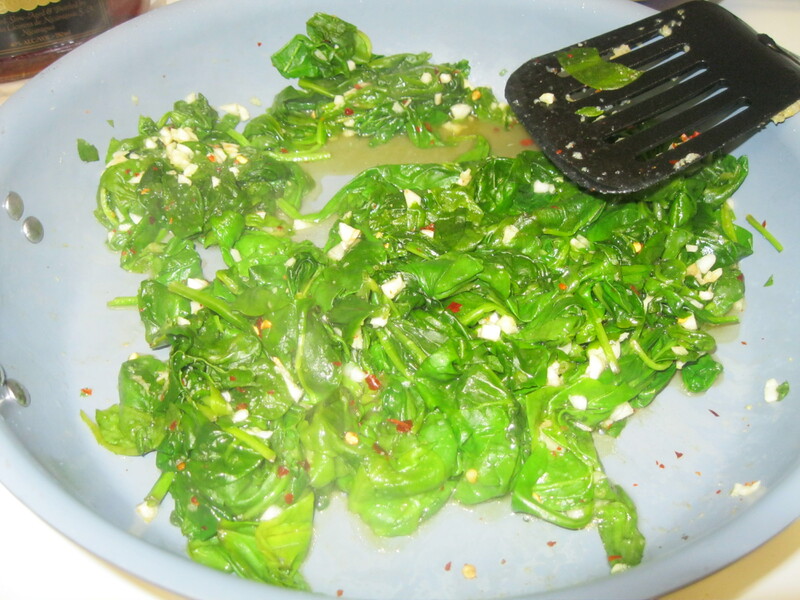 We sauteed some spinach with garlic and flake red pepper. 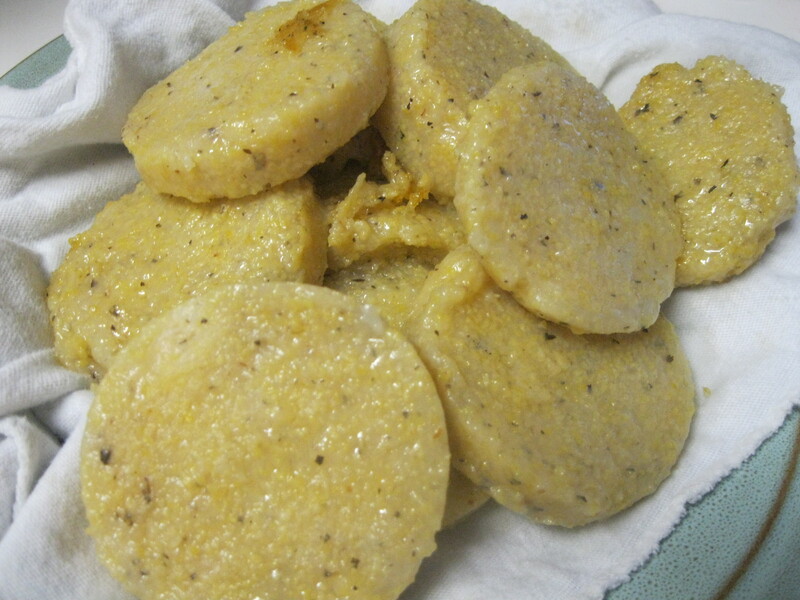 Next we sauteed some polenta. I served it all up hot with extra lemon caper awesomeness poured over the top and a sprinkle of paprika. It was delicious and did not last long. I ended up having to make another batch immediately after this one disappeared. What this really translates to is a recipe that’s robust and reproducible. A huge “THANKS!” goes out to co-author Melissa. She’s pretty rad. I was feeling adventurous today so we made something a little different. 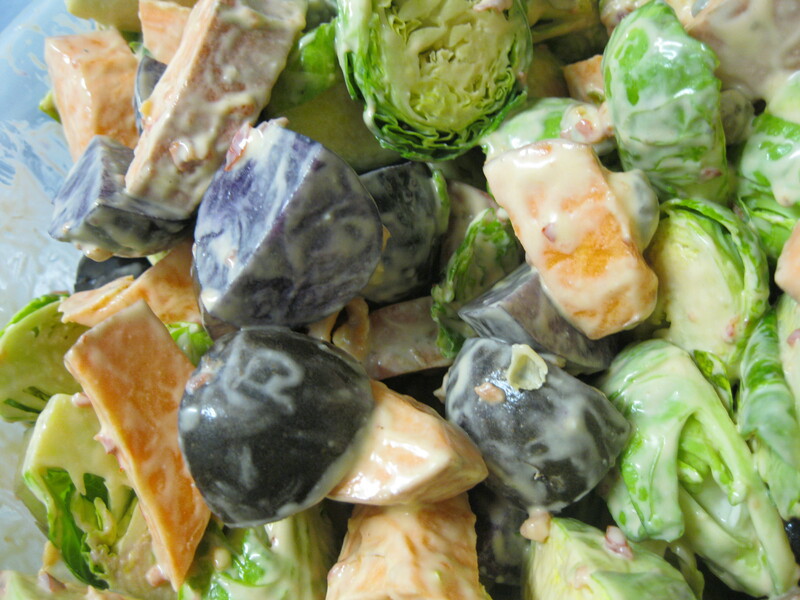 I picked my ingredients based on an inexplicable urge to eat more colorful foods: orange sweet potato, indigo blue potato, and vivid green Brussel’s sprouts. I put the vegenaise, capers, lemon juice, and chili paste into a bowl and mixed it. 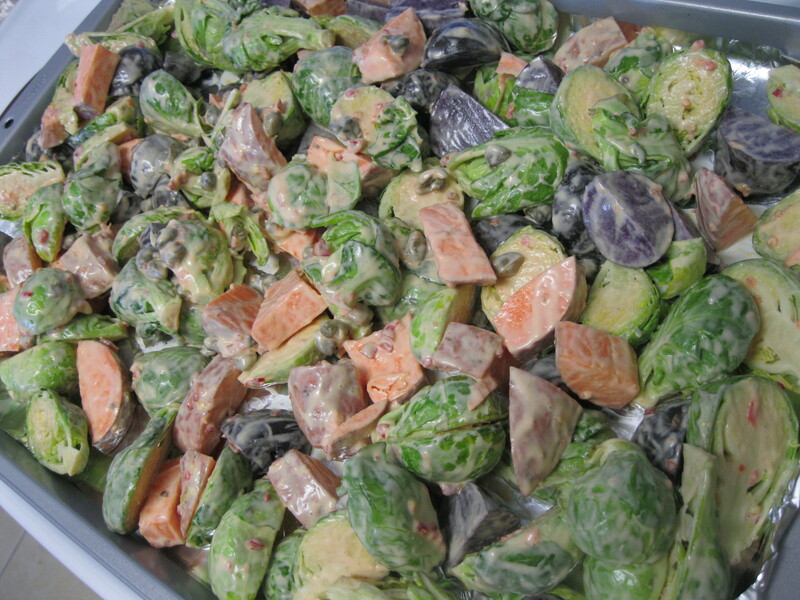 Then I added the potatoes and sprouts and mixed them until everything was evenly coated with veganaise sauce. I put everything onto a foil lined baking sheet and baked it 45 minutes at 350F/175C. It came out moist and flavorful and crisp and caramelized around the edges. 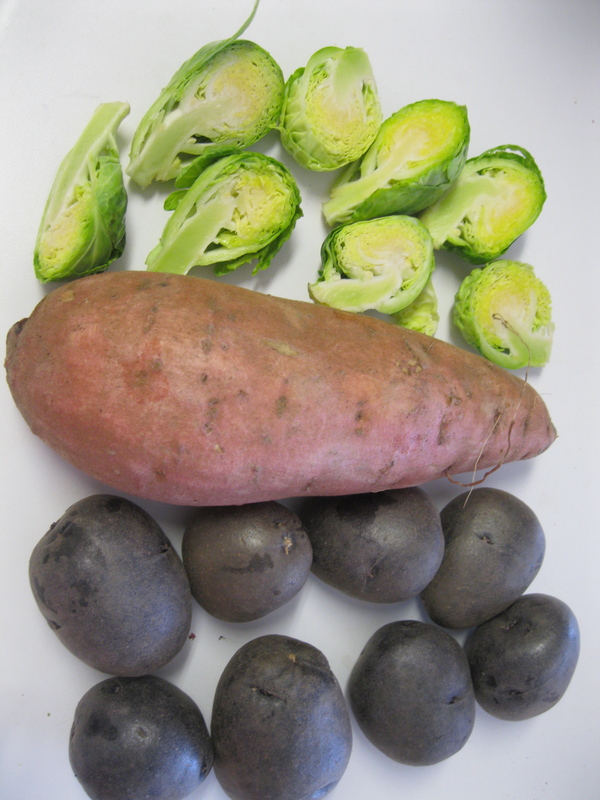 We will probably do this again: the spicy lemony sauce went well with the herbal flavors in the sprouts, the creamy sweetness of the sweet potato and the starchy comfort of he blue potato. It was filling and full of vitamins and minerals. If you’re a fan of Top Chef and/or live in Chicago, chances are high that you know who Stephanie Izard is. I had the pleasure of dining at her very much non-vegan restaurant Girl and the Goat several months ago. All the dishes, meaty or otherwise, were very delicious and satisfying, but it was the Roasted Cauliflower that I loved the most. Fortunately, the recipe is actually posted online. Unfortunately, it is vegan un-friendly. So, I turned it veganese, using ingredients I had on hand. 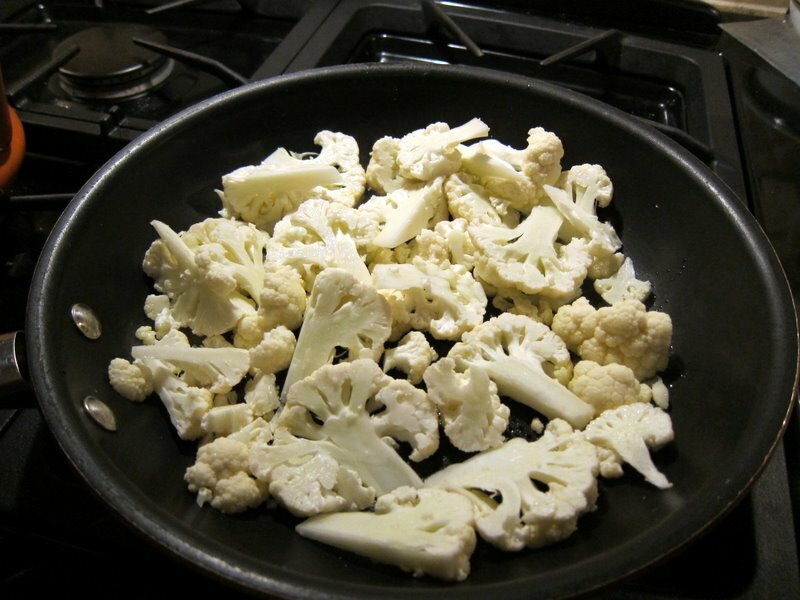 I heated up the oil in a pan and then added the cauliflower. 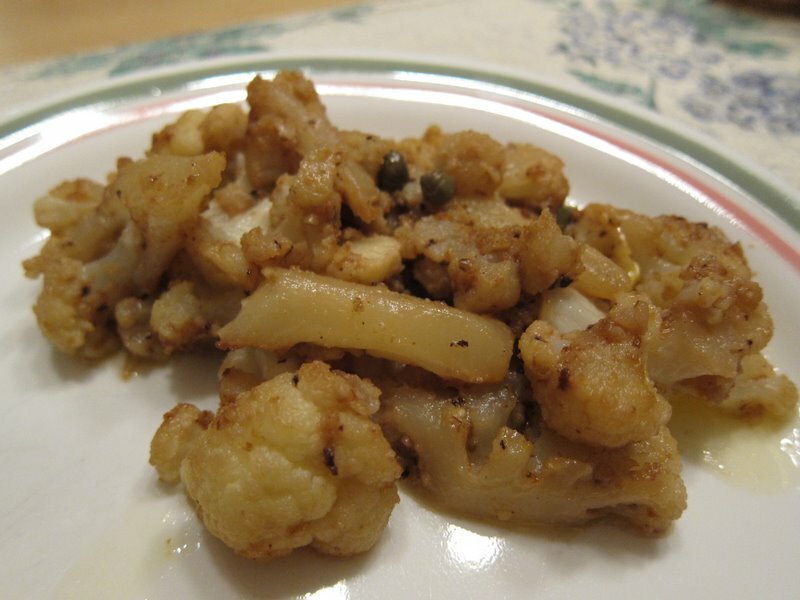 I sauteed the cauliflower on all sides and then added some salt. 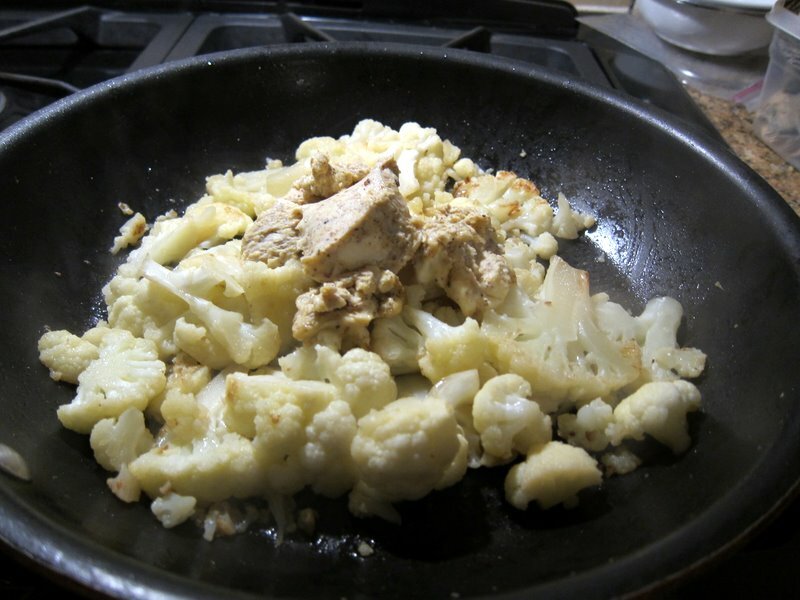 Then, I added the water and let the cauliflower continue to cook. 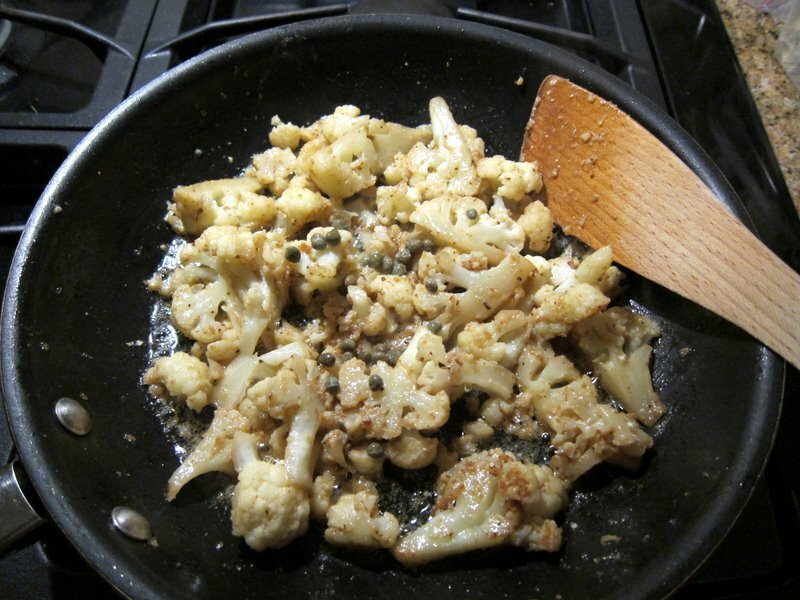 When the cauliflower was cooked, I added a generous amount of the crunch butter. I didn’t do this on purpose. I just didn’t read the recipe very well. I don’t feel as gross as I would if I had used regular instead of vegan butter, but I still feel kind of barfy. Only use a teaspoon! Stephanie’s recipe calls for pickled peppers. 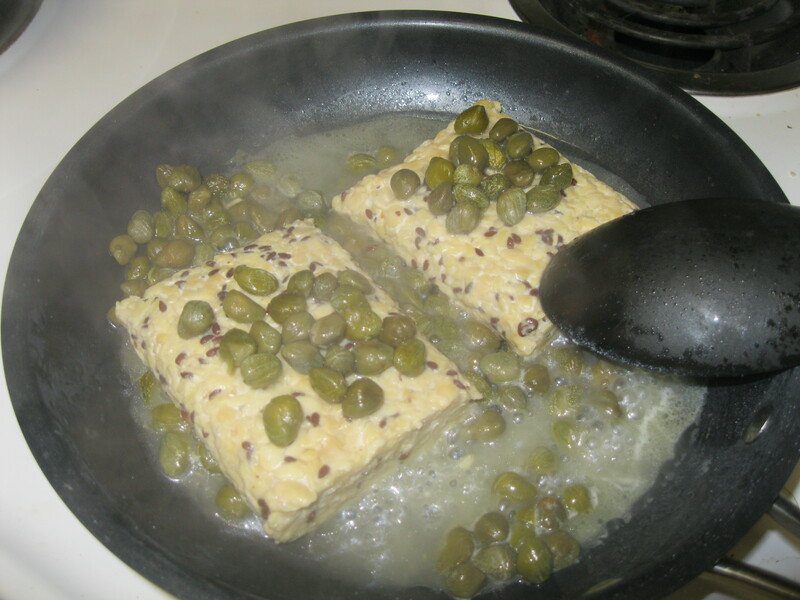 I didn’t have any, so I substituted with some capers. Then, I turned off the heat and mixed in some Parma. This dish was delicious! I went way overboard with the butter, but I can easily mix in more vegetables for a better balance. I’m really glad that I was easily able to veganize this dish. 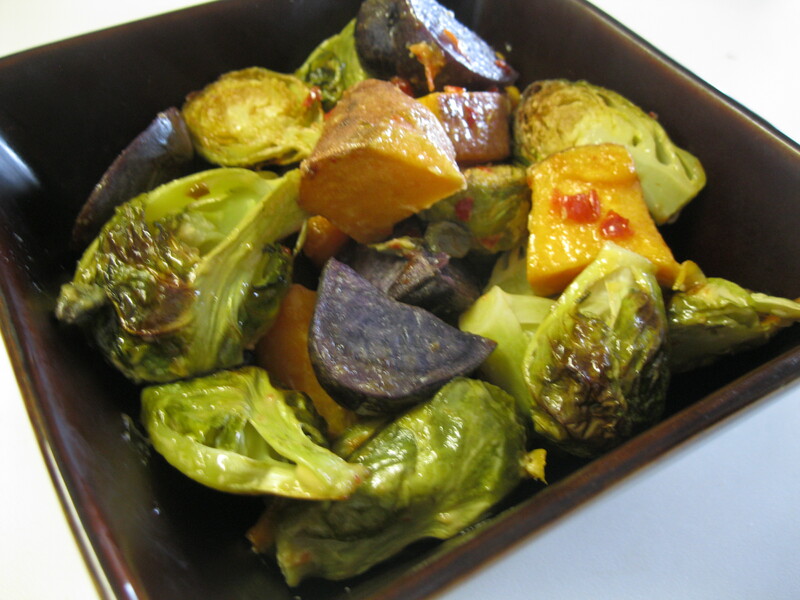 Be sure to read Stephanie’s recipe first; you might have different ideas for veganizing the dish. She also adds pine nuts and mint to hers, which I would have done if I had them! My sister and I have started a cooking challenge of sorts. 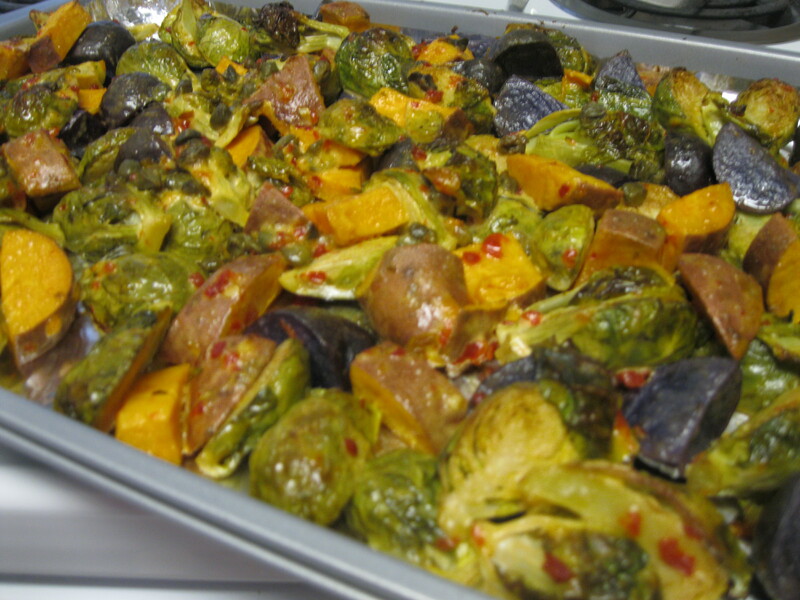 We take a dish and then, together, make two versions of it: vegan and non-vegan. It has solved two problems for us. First of all, she has three kids that keep her busy and so we aren’t able to spend as much time together anymore. Cooking is something that she has to do for her family and that we both enjoy doing, and it’s a fun way for us to hang out and be productive at home. Secondly, it solves the problem of having to accommodate my vegan diet. Last week, we made two versions of chili (we used Christie’s recipe for the vegan version) and two versions of sausage balls (vegan recipe will be posted pending further experimentation and satisfactory results). 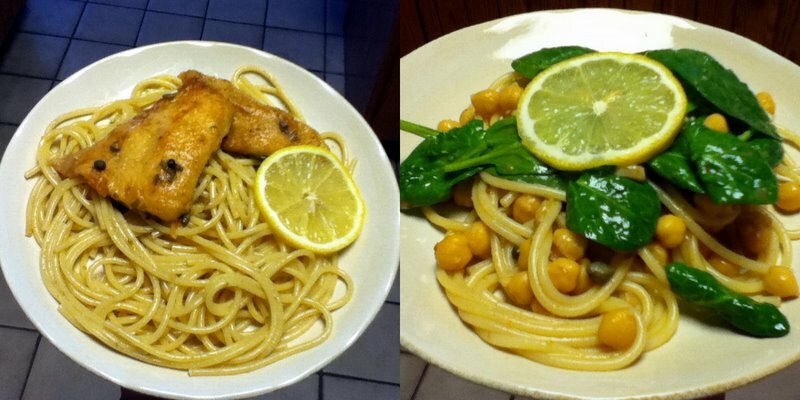 This week, we made chicken piccata and chickpea piccata. Heat up the oil in pan. 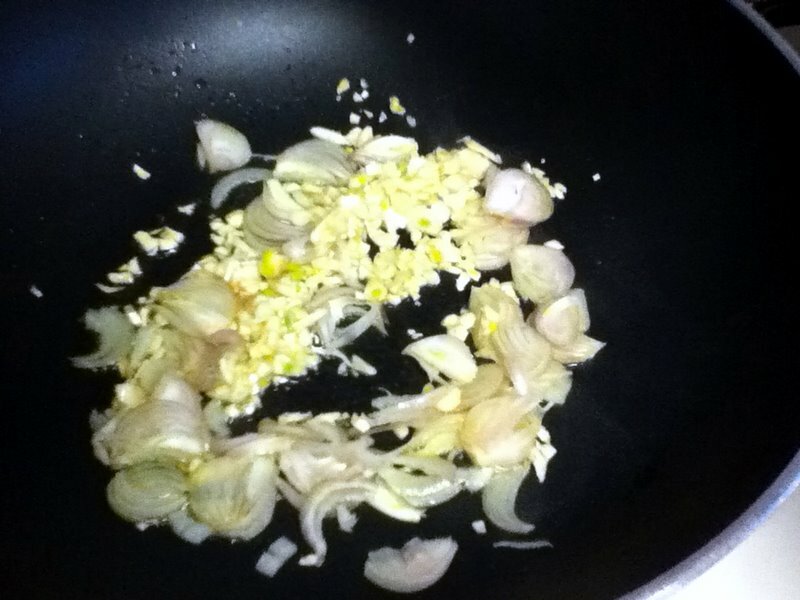 Brown the shallots and garlic. Then, add the breadcrumbs and mix until the crumbs are toasty. Add the broth, wine, salt, and pepper. Let it heat to a rapid boil until it’s reduced a bit. 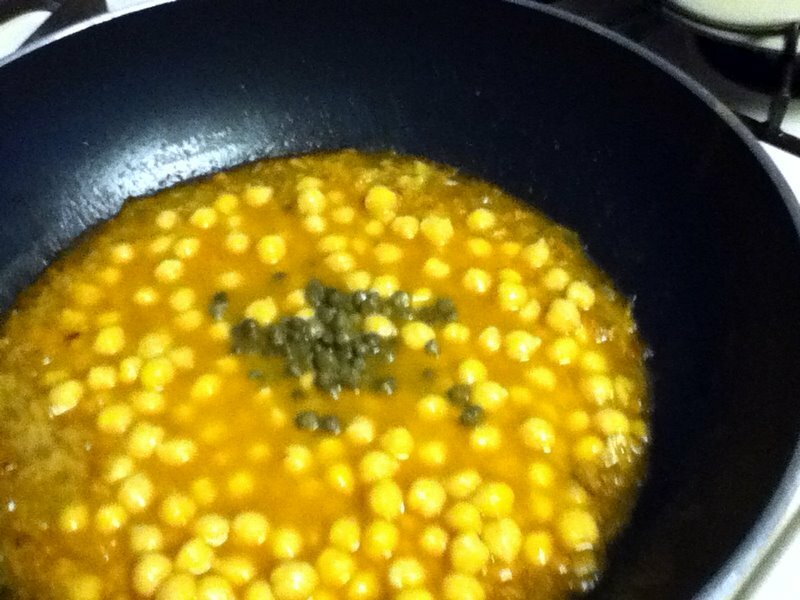 Then, add the chickpeas and capers. 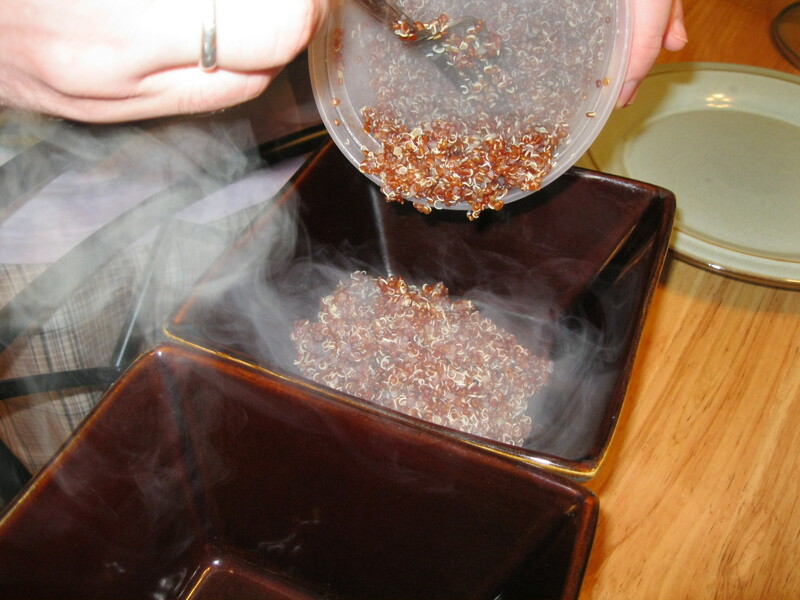 Once it is all heated through, add the lemon juice and remove from heat. Top it with the spinach, which should wilt nicely. 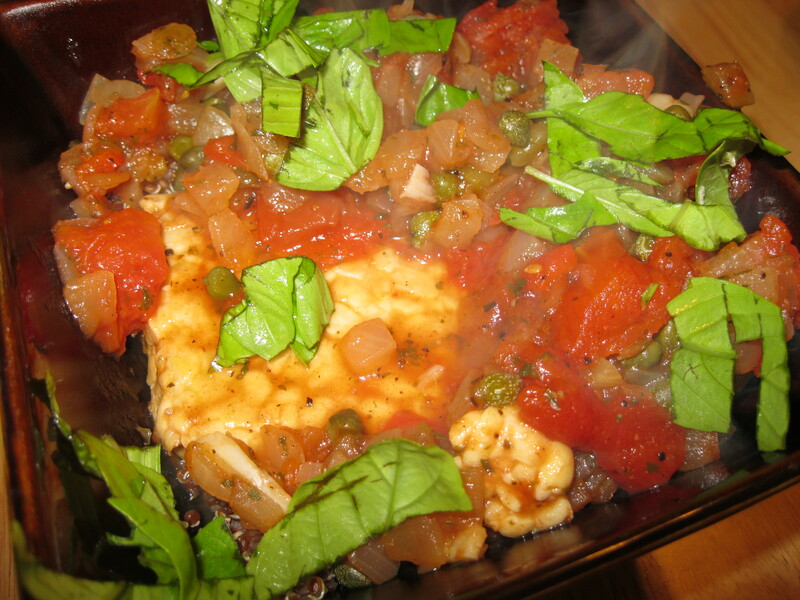 Piccata dishes are great with pasta, mashed potatoes, probably even with rice. We used spaghetti. I tried a bit of my sister’s chicken piccata. Both dishes turned out tasty. I’ll go ahead and say that in my completely biased opinion, I liked mine better. Both recipes were easy and used ingredients that we are both likely to have on hand at any given time. 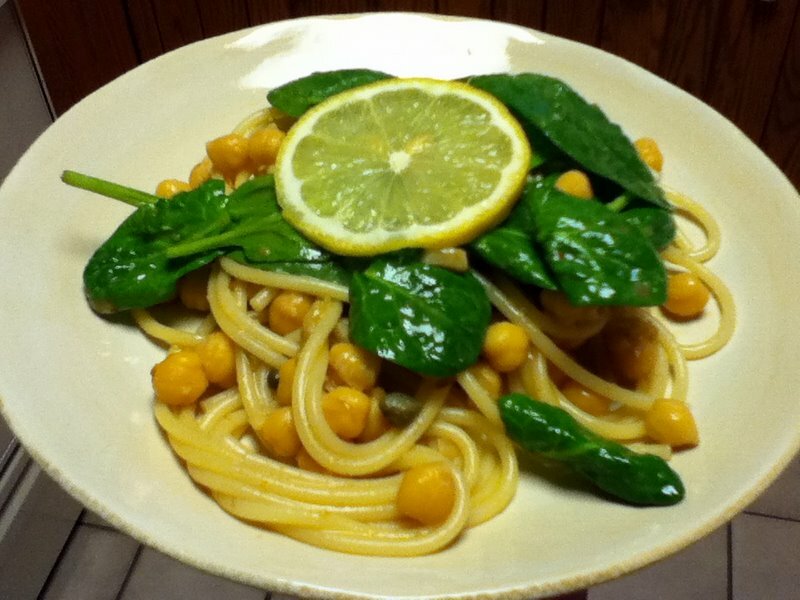 The vegan version cooked more quickly, and it’s a plus that undercooked chickpeas aren’t potentially life-threatening. Bonus: no cholesterol in the vegan version. I think I will be making this recipe many times.